Note: The inspiration for this haiku poem came to me yesterday after watching a youtube video of Tommy Robinson interviewing Sa Ra Garvey about the topic of free speech and how the UK government is doing it's best to put a lid on people voicing their opinions and thinking that people of different groups must find some common ground, put aside their differences for awhile and work together to protect our rights to free speech before they disappear. I wrote this poem yesterday and published it today for the first time on my blog on the 26th of March 2018. 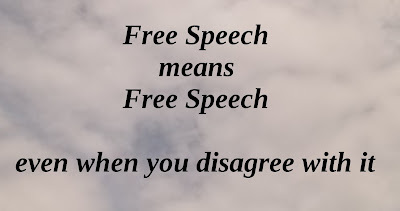 Today free speech is soon (already) gone!